Image caption Work to clear up the suspected oil spill is underway while the probe into the source of the pollution continues. An operation to remove polluted parts of two beaches in Fife is under way. Environmental health officials are trying to work out the source of the pollution on beaches in the villages of Limekilns and Charlestown. The waste is being put into skips by diggers and the beaches remain closed to the public. Environmental health officials from Fife Council have posted signs at Limekilns and Charlestown beaches stating it has been "contaminated by an unknown pollutant". A spokeswoman for the local authority said: "Progress is being made to clear contaminated seaweed and clean up the coastline around Limekilns and Charlestown following an oil based spill in the area. "Samples are currently being tested by Sepa and investigations into the source of the pollution are ongoing. "The affected areas remain closed to the public. " The clear up and investigation involves officials from the Scottish Environment Protection Agency (Sepa), NHS Fife, Marine Scotland, the Maritime and Coastguard Agency and their Specialist Contractor Briggs Marine to deal with the situation. Forth Ports, which owns the nearby port of Rosyth, said the spill appears to be a light refined diesel. The firm also said its investigations on the scene suggest the spill came from a drain on the land. The suspected oil spill has been seen in the Firth of Forth and on the beaches. Joanna McFarlane, of the Charlestown, Limekilns and Pattiesmuir Nature Conservation Group, said there had been reports of "a really strong smell of oil" on Monday night. She said: "This beach means a lot to the community here in Limekilns. Our local school has spent many hours helping to clean it and the community comes out regularly for beach cleans, not just for us but for the wildlife on this coastlines. "But this is out of our hands and I would like to find out who is responsible for it." Sepa said early indications pointed to an isolated incident "which is not ongoing". Image caption Residents said at least ten skips have been filled during the clean up operation so far. 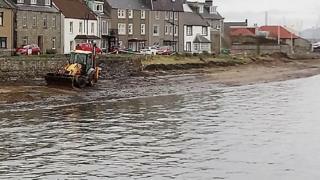 A spokesman for Forth Ports said: "We are currently investigating a reported small oil spill on the beach at Limekilns. It appears to be a light refined diesel. "On receiving the initial report, Forth Ports immediately sent a pollution response vessel to the area to investigate and nothing was found on the water. "Subsequent investigations from our on scene response suggest spill has come from a drain on the land. We are working with Sepa and Fife Council on this."